Summary: Of paramount importance in conserving sea turtles, is reaching the public, particularly our beachgoers on the why and how to protect turtles, especially on the nesting beaches, where turtles and the public are most likely to come in direct contact. Several recent efforts have been effective at reaching this important target audience, including distribution brochures and educational materials with this focused message, public workshops, and the new NESTS (Neighbors Ensuring Sea Turtle Survival) program to increase community participation in sea turtle stewardship. 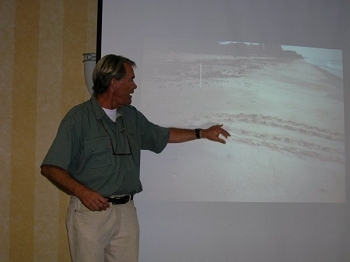 In 2004, the Ocean Conservancy hosted a successful public workshop in the Archie Carr National Wildlife Refuge and helped launch the NESTS program with other partners. In 2005, The Ocean Conservancy will leverage these three efforts together to better protect sea turtles on their nesting beaches. With support from the Florida Sea Turtle Grants Program, we will continue to work with our partners in the NESTS program to expand efforts to promote citizen involvement and host three sea turtle workshops for citizens to correspond with the locations where we are expanding the NESTS program, and use those workshops to launch NESTS locally. The workshops are a valuable tool for informing citizens about the importance of protecting sea turtle nesting areas. The result of this project will be heightened awareness and improved behavior of the public, thereby improving sea turtle conservation.